When writing about a particular rhododendron, it is always possible to consult the experts and the various books to get fairly definitive information. When it comes to fertilizing however, consulting two rhododendron experts will lead to at least three contradictory bits of advice. What is on the Internet is also not so useful as it is often tailored to specific climates and soil conditions. I am going to try to distill my experience and things I have learned from other local rhododendron growers, where �local� refers primarily to the lower mainland, i.e. Vancouver area, of British Columbia, though most of this should apply to the Pacific Northwest which has similar climate. However I am certainly not an expert, so what follows should be taken with a very large grain of salt ...er, fertilizer. Like any plant, rhododendrons need a steady supply of nutrients, nitrogen, phosphorus, and potassium, the N-P-K of fertilizer mixtures, as well as calcium, iron, sulfur, and other micronutrients. The nitrogen promotes vegetative growth. Phosphorus is important for root development and flower production, and potassium improves vigor and disease resistance. Some fertilizer mixtures include something to make the soil acid, but that normally isn't really necessary in this area since with all the rain we get most soils are naturally acid. The question is whether one needs to use chemical fertilizers to provide these nutrients. The world is divided into 'those who don't' and 'those who do', with a significant group of us categorized as 'those who intend to, but sometimes don't get around to it'. Whether you plan to use chemical fertilizers or not you should start as though were not going to. That means you should regularly add a layer of mulch to your rhododendrons, an inch or two thick, out past the drip line. Bark mulch, well-rotted compost, pine needles, or other coarse organic materials are good. Peat moss, sawdust, and green grass cuttings are not good, as they shed water. Manure is not good as it tends to be alkaline. The late Frank Dorsey of the Vancouver Rhododendron Society used shredded oak leaves, which he said, with his usual wry sense of humor, he pirated from a secret location in the middle of the night. One caution though - fresh organic material, e.g. fresh bark mulch, absorbs a lot of nitrogen when it first starts to decompose. This nitrogen is later released and slowly made available to the plant as the decomposition proceeds. However such fresh materials can lead to an initial nitrogen deficiency and so if you use them you should add some high nitrogen chemical fertilizer at the same time. So you have done everything right so far. Do you need to use additional chemical fertilizers as well? It is probably not really necessary in most lower mainland gardens, at least once the plants are well established. However I do, as do most others with large collections with whom I have talked. I missed a year a few years ago and I thought the plants suffered. They didn't die, but the next year when I got back to my usual schedule of fertilizing, I thought they grew better, were healthier, and bloomed better. What most people seem to do is to fertilize twice a year, the first time in February/March before the plants really start growing and the second time in June, right at the end of flowering season. For the first application I for years used Green Valley 10-8-6 Rhododendron and Azalea fertilizer. This was developed for our climate 20 or 30 years ago by a number of members of the local rhododendron societies, working with the Green Valley people. It was reasonably high in nitrogen, some of which is delayed release, and contains the needed micronutrients. It should be broadcast under the plant out to the drip line. I use a carefully measured amount for each plant - a small handful for small plants and a large handful for large plants! This particular brand is no longer available as Green Valley went out of business. Similar formulations specified for rhododendrons are usually available at garden shops. Alternatively, agricultural supply companies have a variety of fertilizer mixtures which will work. What is important is a reasonable mixture of N-P-K, some of which is time release, and some micronutrients. For the June feeding I use this same fertilizer or any of the other brands of specifically rhododendron fertilizer which are available in garden shops. These tend to have relatively less nitrogen and may be more appropriate for later season application, as they may be less likely to stimulate new growth so late in the season that it doesn't have time to harden off before winter. There is another approach, espoused by some, which advocates fertilizing in the late fall or early winter. The theory is that in our climate where the ground (usually!) isn't frozen over most of the winter the roots continue to develop through the winter and early spring. Thus a winter feeding stimulates root growth and leads to a healthier plant. I have never tried this, but it does sound logical. However, one would have to time the application so the fertilizer reached the root zone, which is very shallow for rhododendrons, in the very early spring as the ground started to warm up. If applied too early I would think the winter rains would wash a lot down below the root zone before it could be used. Finally, one reads that some rhodos 'don't like fertilizer'. This is supposed to be true particularly of the small leaved varieties and of some specific hybrids. I have never seen any evidence of this. I do match the amount of fertilizer to the size of the plant, but I have never seen any obvious fertilizer burn for plants in the ground. For plants in pots it is a different story, and I have over fertilized and burned a number of them. I am sure there is formal research about fertilizing practices applicable to controlled situations in commercial greenhouses, but for the wide variety of conditions we experience in home gardens, our knowledge comes mainly as word of mouth from local growers. So perhaps the best approach is to talk with experienced growers in your own local area. Rhododendrons in general are said to like acid soil. The reason for this is that acidity of the soil affects the availability to the plants of specific nutrients in the soil or in the fertilizer which is added. Take a look at the graph shown in the figure. [Taken with modifications from 'Science and the Garden - The Scientific Basis of Horticultural Practice', 2nd edition, ed. by D.S.Ingram, D. Vince-Prue and P.J. Gregory, page 102, published by Blackwell for the Royal Horticultural Society.] The figure shows the relative availability of various plant nutrients as a function of the pH of the soil. Neutral is pH 7. 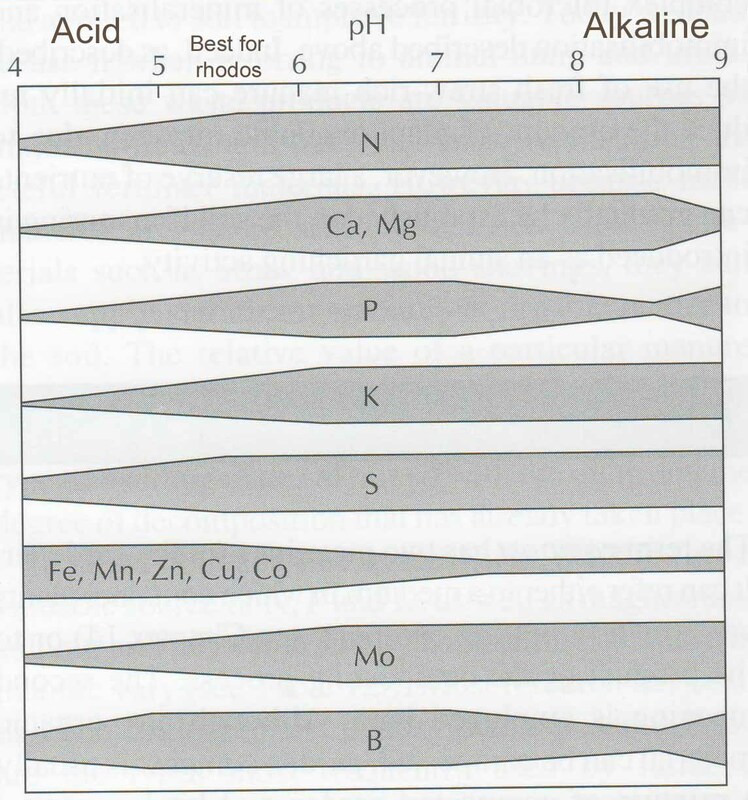 Lower numbers correspond to acidic and higher numbers to alkaline soils. Most rhodos are said to prefer a pH of 5-6, which is slightly on the acid side. At the preferred pH the main nutrients N (nitrogen), P(phosphorus), K(potassium) and also S(sulfur) are available. Also Fe(iron) and some of the other micro nutrients are available. Not shown is the fact that as the pH becomes much more acidic, aluminum, which is toxic to plants, becomes more available, so one doesn't want the soil too acid. As the pH rises (soil becoming more alkaline, or sweeter) two things happen. First iron becomes unavailable. In rhodos this leads to chlorotic leaves with yellow veins. Secondly Ca(calcium) becomes more available. That is bad for rhodos which need some calcium, but not too much, though there is still scientific debate as to whether it is the calcium or the carbonate which goes with it that causes the damage. That is why one should never use regular lime on rhodos, as it is mainly calcium carbonate. Instead, if the soil needs sweetening, use dolomite lime, which is slower acting, but contains a lot of Mg(magnesium) in place of the calcium, and thus does less damage. Normal pure rainwater has a pH of 5.6, but the pH can be much lower in polluted areas (acid rain). Some of this acid is neutralized by elements in the soil, depending on the soil type. But the end result is that in our rainy climate the soil tends to be naturally acid, part of the reason we can grow rhodos so well. In extremely rainy areas the soil may get too acid and so some people in such areas use a bit of dolomite lime on their rhodos. In our garden the pH seems to be around 6, so I have never found that necessary.